My students LOVE reading this short story and discussing the outcome. Who came out: the lady or the tiger? 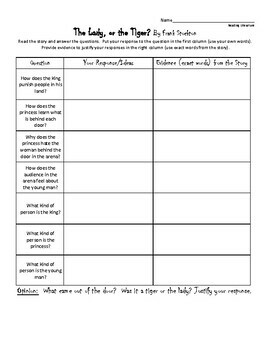 The second worksheet asks analysis questions about the text and then they must give their responses and then use evidence from the text to support their responses. 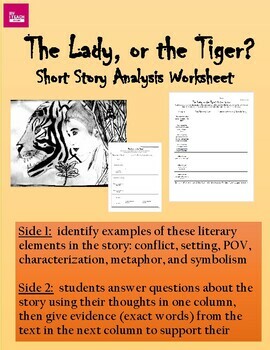 Finally, students need to write an argument about who came out of the door: the lady or the tiger. This is a quick story to read. (It's only about 2 pages long.) I like to do this early in the school year to determine where my students are in their reading comprehension abilities as well as their ability to identify literary elements. They love to argue about the ending. It gets pretty heated because it's all about jealousy and true love. Older students love to think about what actually happened to the young man. These worksheets are super simple to grade, too! Just look at the evidence column, and you know that their responses will be correct.